President Obama visited Ground Zero, the site of 9/11. "When we say we will never forget, we mean it," he said. U.S. President Barack Obama visited Ground Zero in New York City on Thursday, where the Twin Towers of the World Trade Center formerly stood. Obama’s visit came following the death of Al-Qaeda leader Osama bin Laden at the hands of U.S. forces earlier this week. Before the ceremony Obama met privately at the memorial site with about 60 family members from various 9/11 organizations, AP reported. He also visited the firefighters and police officers who had turned into heroes due to their quick and brave response to the terror attacks, a response which cost them heavy casualties. “We keep them in our hearts. We haven't forgotten,” Obama said while visiting the First Precinct police station in lower Manhattan, which was the first on the scene following the attack on the World Trade Center. Obama’s visit to the site of the deadly terror attack came one day after it was announced that he had decided not to release a photo of bin Laden’s body. 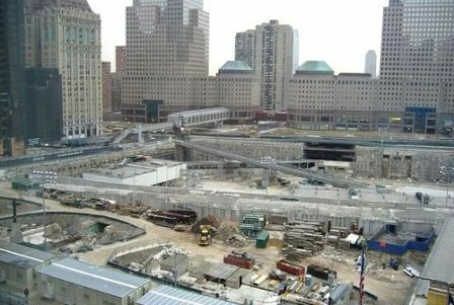 Ground Zero itself has been in the headlines in recent months, being only several hundred feet from the site of a planned multi-story Islamic center and mosque, which critics have said is a disgrace to the victims of the terror attacks. On Friday, noted AP, Obama will visit Fort Campbell, Kentucky, which is home to the Army unit involved in transporting Navy SEALS in and out of bin Laden’s compound during the operation. AP cited White House officials who said Obama intends to privately thank participants in the raid during his visit.